2013 XC: No more updates are being made to this page - goto 2013 XC (link on left). Even TRACK updates will be referenced on the XC page. SJMN Athletes of the Year: Miguel Vasquez (Hill) and Piedmont Hills Girls 4x400. CCS All-Time Top 100 additions: 101 girls got on to the list from 2013, boys will follow in a day or two (updates can be made throughout the summer, just let me know). Bay Area Running Camp: Spaces filling up fast. Team discount of $50 if 5 or more team members attend camp. Email us at bayarearunningcamp@gmail.com for code. Registration includes shoes, shirt, notebook and awesome speakers. State Weather? : Thank goodness we didn't get this kind of weather this weekend (Monta Vista @ Los Gatos in 2012). 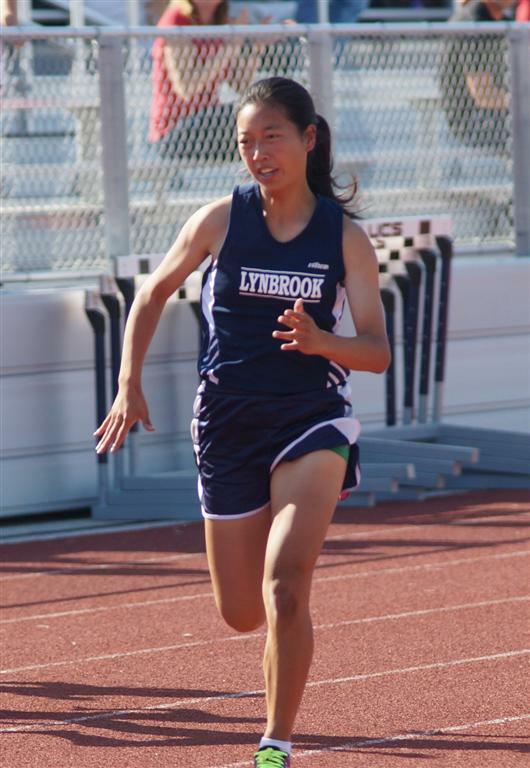 Lynbrook Awards Night: Michelle Shieh #5 in the TJ (34-09.25) and Claire Yuan #7 in the 100 (12.56), #9 in the 100H (16.67) and #9 in the 200 (26.28). 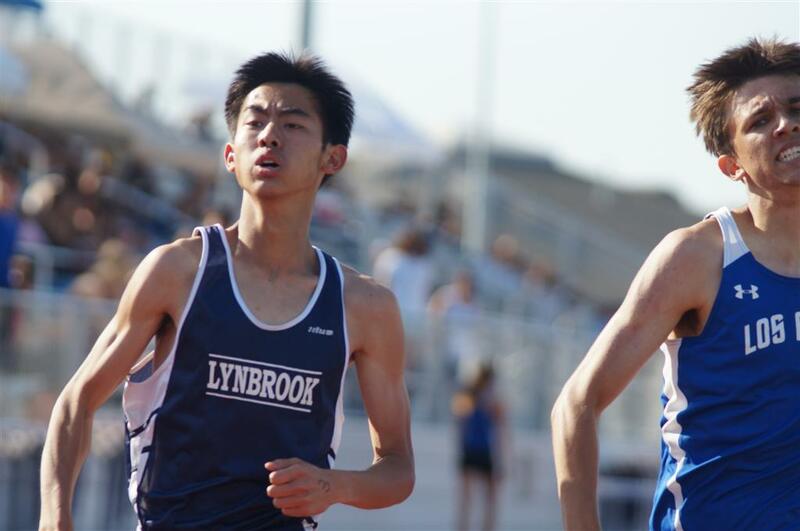 Lynbrook Awards Night: Davis Catolico #4 on the TJ (45-07.25) and #10 in the 400 (50.86), Anthony Huang #9 in the 400 (50.85), Andy Shen #8 in the 800 (1:58.11), Daniel Sun #8 in the 200 (22.38). 2009 Jr Hi Sections: Starting from inside lane to outside: Rintala (Mitty, 5:25), Weigel (Mt View, 5:27), Pouguette (Leigh?, 5:32), Silverman (Lynbrook, 5:33), ?, Akaogi (Monta Vista soccer, 5:45), Kuczynski (Mt View? ), Katz (LG, 5:56), ?,?,?, Rohrer (Fremont). 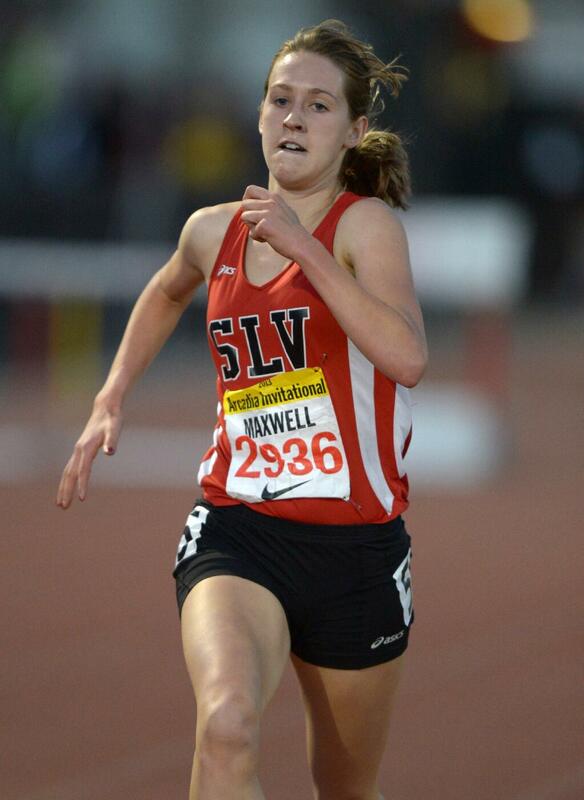 Anna Maxwell (SLV): misses Nikki Hiltz All-Time CCS 1600 record by .12 but does get the CCS Meet Record that was held by SLV athlete Alejandea Barrientos. 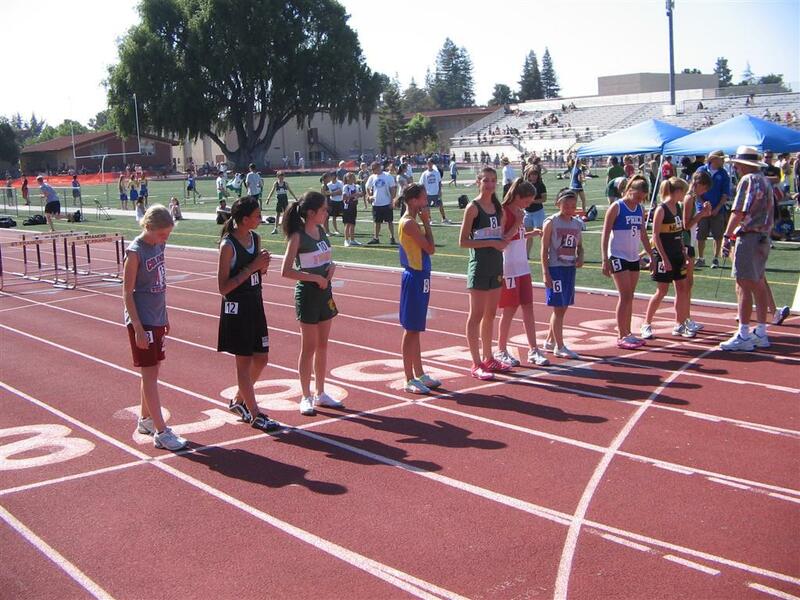 "Virtual" Middle School Championships: Taking common event results from the Championship Meets of the "County Meet" (SCCES, VJHSAL, WVAL) along with PVAL, ADAL, SCVAL, WBAL (1685 total athletes) we get the closest thing to a CCS Middle School Championships. Run For The Bulls 5K: Where you actually get a head-start on "The Bulls" (Olympians) who try to run you down (the "Unknowns" are the Bulls). 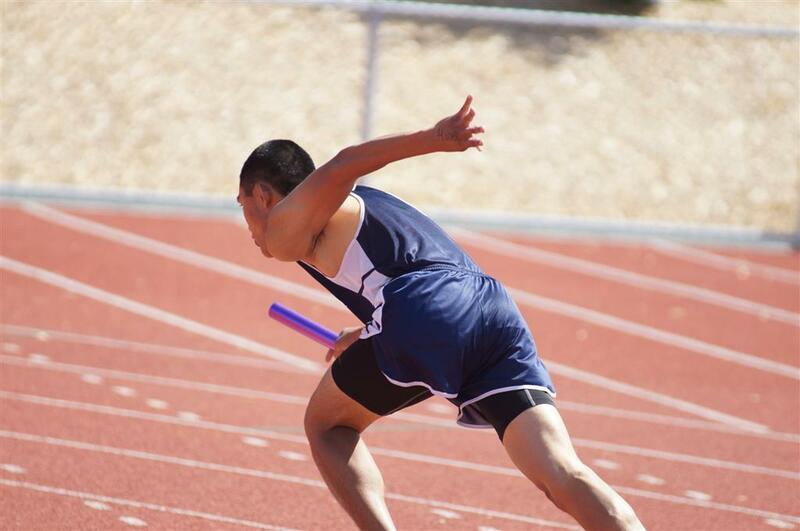 Bellarmine 4x100 Team: Mercury covers the Bells and their improving team. Corporate 5K & Track Nationals: Parents/Coaches, how would you and your athlete(s) like to compete TOGETHER as a team once the track season is over? The Corporate Nationals has a place for you. Apple, HP, Google, Oracle, Yahoo, EBay, Hitachi, SAP, etc. these are all companies that YOU work for, why not get them on the track to compete with GE, TI, IBM, AT&T and others. You could start with just the Team 5K Road Race or if you're adventurous, get out on the track as well. 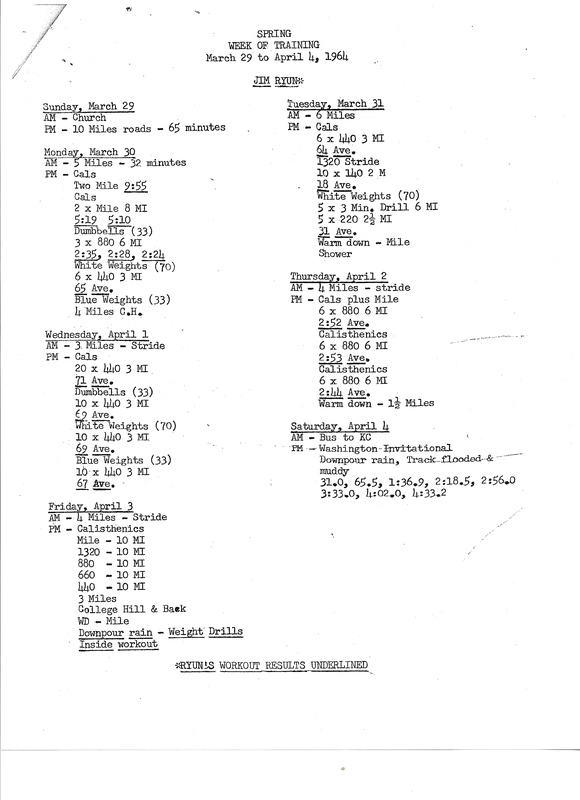 Distance range from 100m - 1 mile as well as LJ/HJ/SP/DT for the fields. CCS Team Predictions: If CCS were run today and everyone matched their season best and ran in all the events that they are currently listed in, this is how the Team Standings would shake out. SJ Mercury News: Story on the Top 8 Meet from the Mercury News. Palo Alto isn't dwelling on a key loss: From the Mercury News. Esophageal Cancer Awareness 5K: Nice turnout for a first year event. 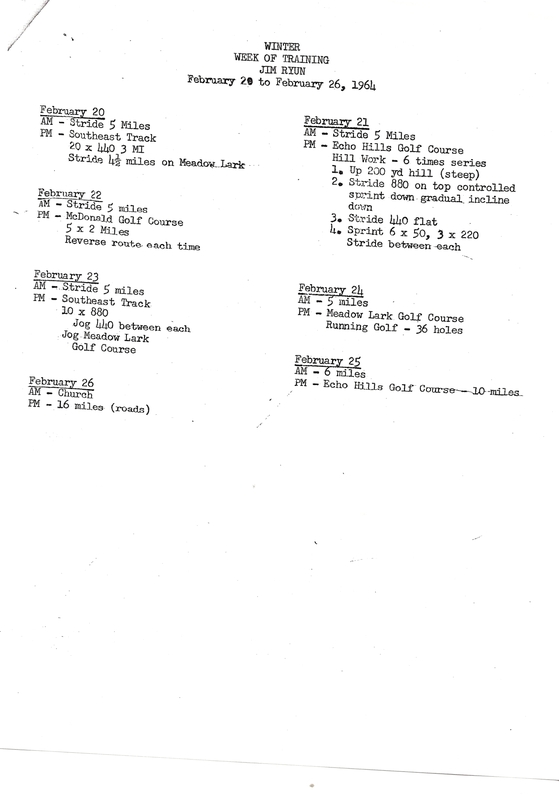 Jim Ryun HS workouts: Oct '63 / Feb '64 / Apr '64 / June '64 (pre-Sub4). 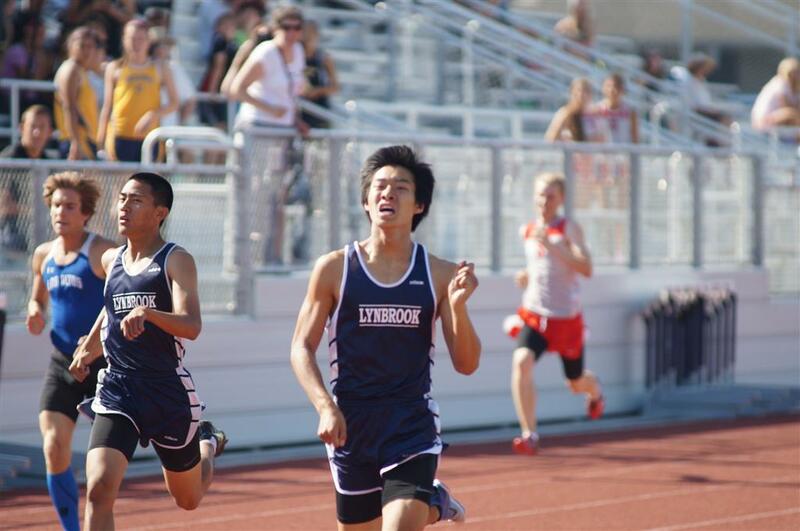 Lynbrook Vs Paly Meet Records: Big showdown between the two "unbeatens" in the Varsity Boys this Thursday. Big Invites: coaches, let's keep the times honest... for the CCS Top 8 Meet times must be FAT (sprints) and must be from 2013. Please make my life easy so I don't have to send out too many emails to verify those marks. Lynbrook Vs Mt View Meet Records: Lynbrook takes their 2-0 Varsity Boys team record to Mt View this Thursday. Girls To Women 5K: A race everyone should get behind. 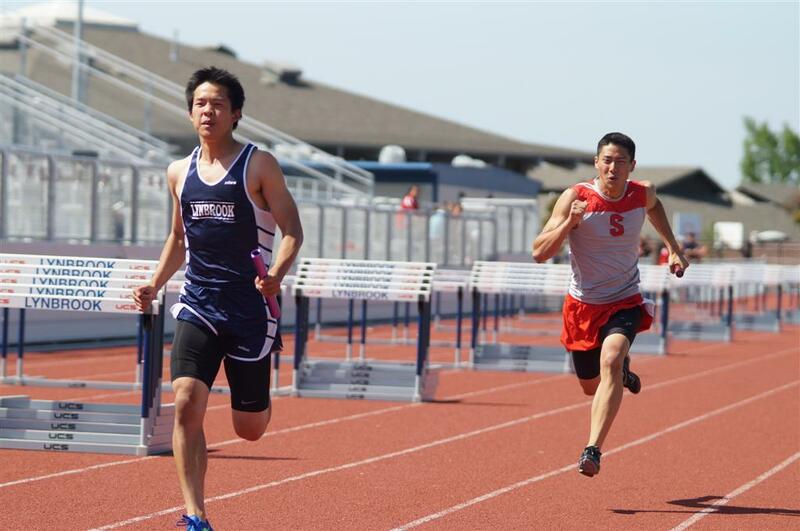 Lynbrook Vs Milpitas Meet Records: Stadium Records will be set in every event this Thursday when Lynbrook hosts it's first dual meet in two years and it's first in the new stadium. 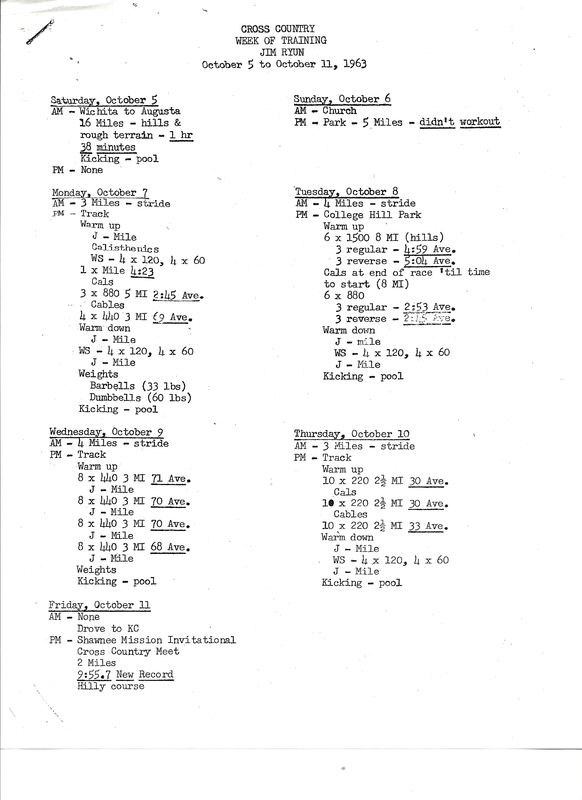 Lynbrook Vs Gunn Meet Records: Second meet of the season for the Vikes. My loyalties are torn since I'm a Titan as well. Eric Surprenant (Lynbrook): representing his Alma Mater with pride. Oh yeah, and the guy to the left of Eric... just happens to be Ashton Eaton, the 2012 Olymipic Gold medalist in the Decathlon and the current World Record holder. 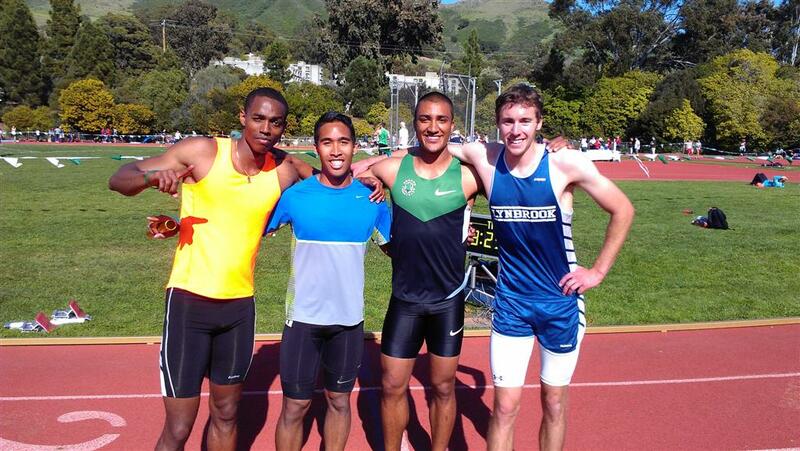 They ran a 4x400 last weekend with Eric leading off (49.x) and Eaton splitting a 46.x - yes, they won the race. 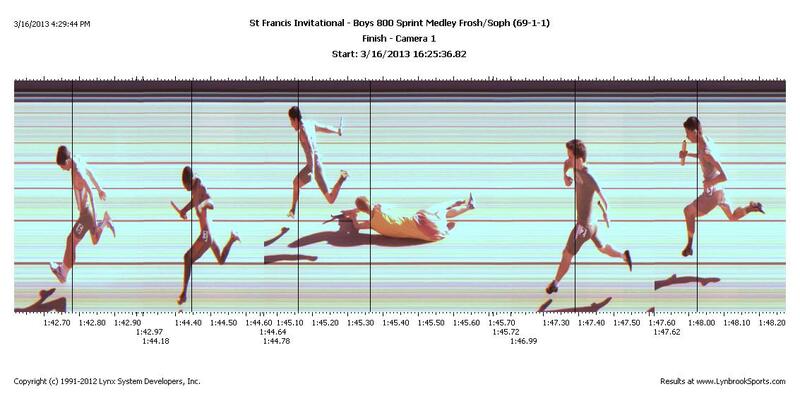 SF Invite: My favorite finish shot of the day from the St Francis Invite, someone giving it their "all", all the way to the finish. 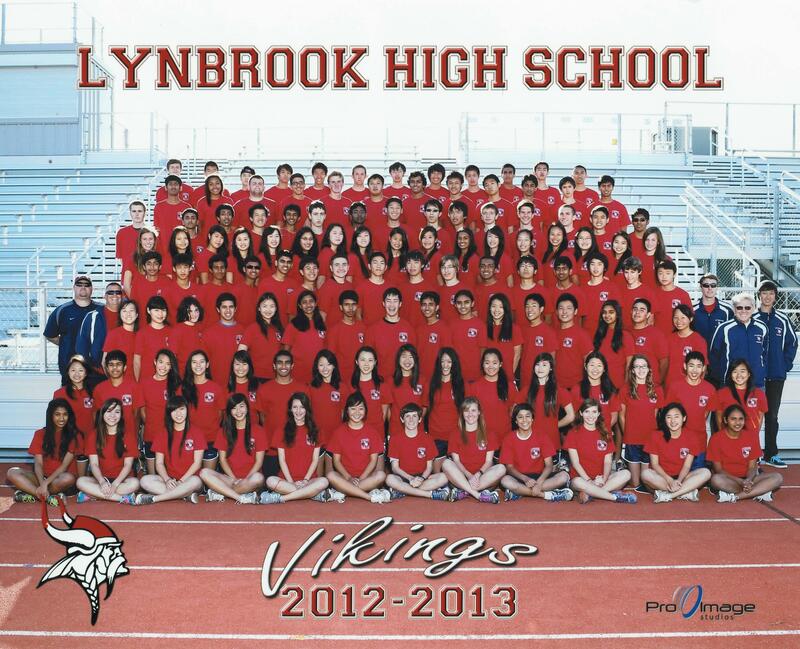 Lynbrook Vs Los Altos Results: Way to go Vikes! Winning all divisions, except the FSB. PR's abound, excelent start. Lynbrook Vs Los Altos Meet Records: Dual meet season gets underway for the Vikes as they go and visit Los Altos this Thursday. Should be some good matchups all the way around. 1960 Olympic 1500 Finals: Not how you usually win a gold medal but Herb Elliott never lost a 1500/Mile at World Competitions in his career. He retired at age 22 with two World Records and a gold medal. Motivational Video: very cool 2 minutes on "Pre". 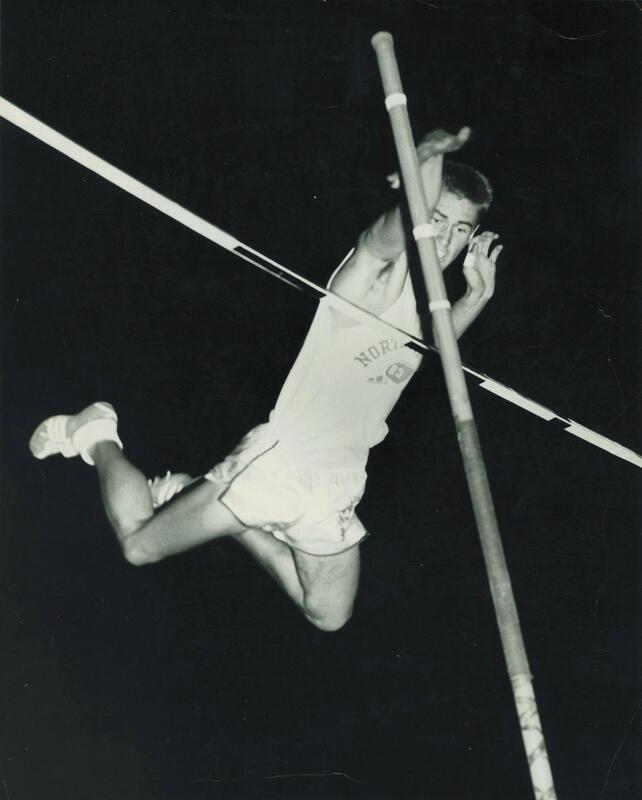 Jim Brewer (N Phoenix HS): was the first HS vaulter to clear 15-00 in 1957 and he was the 10th person in the World to clear that height. Skinny-Mini Mile Invite: The smallest track I've ever seen with 19 laps for the mile. Hank Lawson: FINAL UPDATE FOR LYNX CLINIC. Lynx Clinic Update #2. Directions to room and the Lynx Clinic slides. Jose Pina Jr (Lincoln): won the 5K while Jose Pina Sr (WVJ&S) won the 10K making the Campbell Valentines Run a family affair. 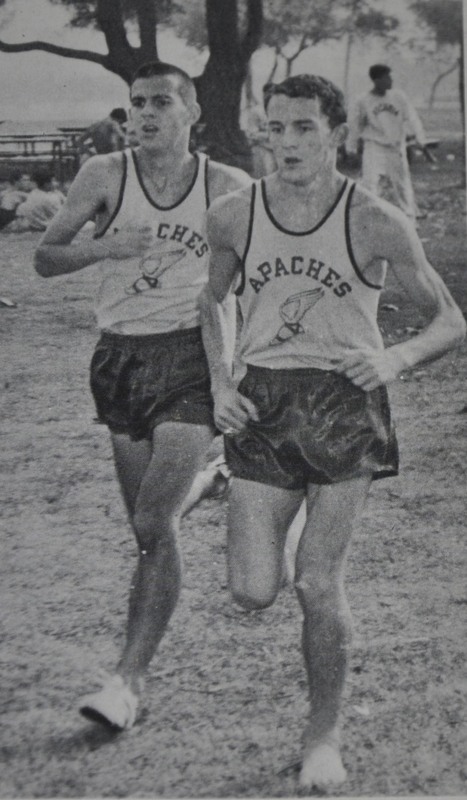 Scott Chisam (Harker coach): is the "barefoot runner" for Arcadia HS in this 1965 photo. Scott shared this story with me ... "Arcadia ran (still does?) at Arcadia Park, a flat all grass 2.0mi course. In one area of the park, there were millions of those stickers that are weeds, blended into the grass. 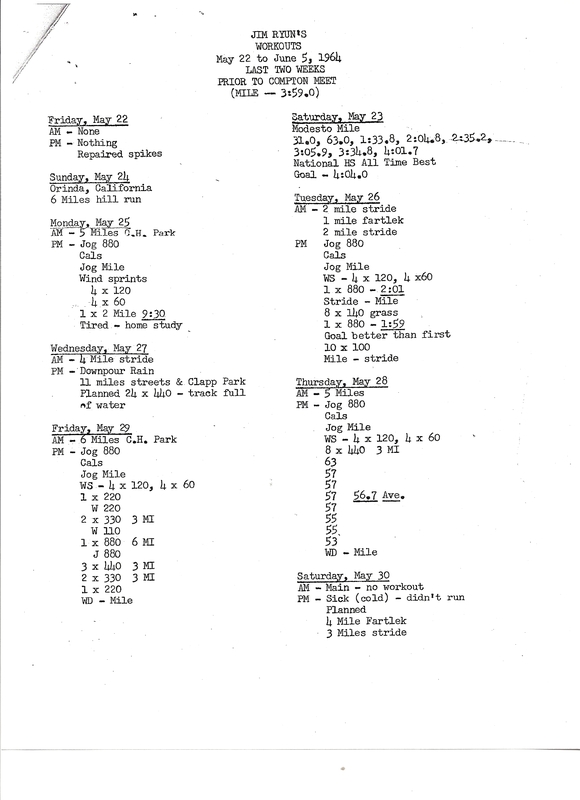 The Arcadia team would casually move to the outside (no stickers) of the course at that point, while the opponent would always run a straighter line......yes, loved to hear the swear words as they ran through the "briar patch"...... Most also ran barefoot." LA84 Foundation Clinics: The third clinic, which will be held Saturday, February 9, 2013, click here for more information. Jerry Rose: LELAND HS: Needs 2 good assistant coaches for the 2013 track season. Coaching Pole Vault and Long Jump & Triple Jump Stipend available; all interested applicants, please contact AD Michael Sparrer 1(408) 591-4962 michael_sparrer@sjusd. org or Head Coach Jerry Rose jerry_rose@sjusd.org. Mady Fagan (Los Gatos): jumps 5-09 in the HJ for a new Los Gatos School Record (old record by Michelle Johnson in 2005 and Cindy Sandberg in 1975 of 5-08). Coach Bokamper: Terra Nova is looking for a throws coach for 2013 season. Practice is Mon-Fri 3:05-5:30. Please email Coach Bokamper Noeth at mnoeth@juhsd.net. LA84 Foundation Clinics: The second clinic, with Jim Ryun, which will be held Saturday, January 26, 2013, click here for more information. Lance Thayer: Mountain View High School is seeking a throws coach for the 2013 season beginning January 28. Also possible assistant coaching postions for distance, sprints and hurdles. Please contact John Payne or Lance Thayer via email at John.Payne@mvla.net. 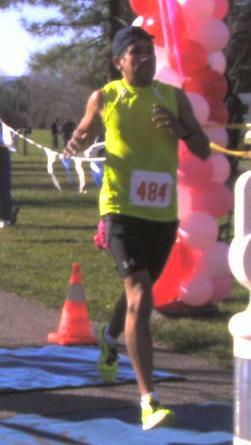 Sammy Cai: Presentation is looking for 1 to 2 sprint coaches for the 2013 season. We have a competitive fun group of athletes ready for this season. Positions are paid stipends. Practice is Monday-Friday 3:15pm to 5pm. Please email Sammy Cai at slamuri@hotmail.com. NFHS Rule Changes: for 2013 Track & Field. Hank Lawson: LYNX CLINIC IS A GO! Finish Lynx Clinic is set for Feb 17th at St Francis HS from 9:00-4:00. Lynx Clinic Update #1. Tammie Marshall: Valley Christian HS: is looking for assistant coaches for 2013 track season to coach hurdles, high jump and assist in other areas. Stipend available; all interested applicants please contact Head Coach Tammie Marshall via email at tmarshall@vcs.net. 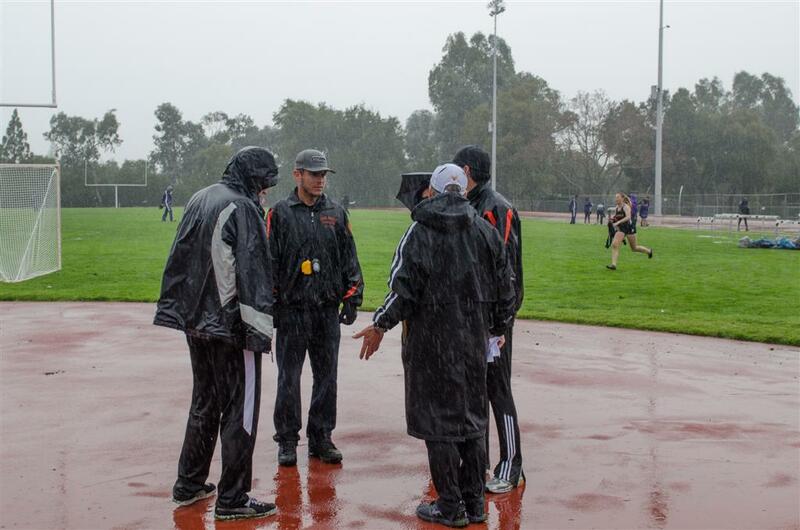 SCVAL Coaches Meeting: The SCVAL Track Preseason Meeting will be held on Jan. 15, 4pm at Santa Clara High School. The meeting will be held in the Conference Room of the Administration Building. Please send any items for the agenda to Julie L'Heureux. Track Conditioning Camp: PattiSue Plumer is putting on a Winter Conditioning Camp at Gunn HS starting on Jan 7th. Hank Lawson: Coaches - Do you have a FinishLynx system and want to train your parents on how to use it, or want to learn yourself? I'm trying to find out if there is an interest in a one day Lynx/MM class that myself and Jim Clark will teach (free of charge) if there is enough interest (6 folks needed). It would be on one of the 3 dates (all Sundays), Feb 10, Feb 17 or Feb 24. Email me your interest (by Feb 1st) and preference of date(s) and if I get enough folks I will contact you by Feb 3rd with the date and location (which would be in the Cupertino/Saratoga area). 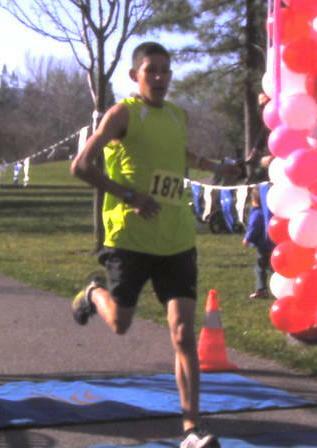 Results: of the Resolution Run held on Jan 1st at Los Gatos HS. Matt Ilarina: Archbishop Riordan HS, San Francisco, is looking to hire a Discus Coach and a Pole Vault Coach for the 2013 season. Competitive stipend is available. Please contact Head Coach Matt Ilarina. Email- Mdilarina@riordanhs.org. Daniel Haas: Burlingame High School is looking for a Long Jump/Triple Jump coach and a Throwers coach for the upcoming 2013 season. Part-time needed including stipend. Please contact Head Coach Daniel Haas at airhaas@gmail.com if you are interested. CCS Top Returnees: This list doesn't take into account any freshman or athletes that did not compete in T&F last year. Matt Lai: Woodside Priory School is looking for a Throws coach for the upcoming 2013 Track & Field season. Looking for someone who can come out at least 3 days per week. Stipend is available. Please contact head coach Matthew Lai at mlai@prioryca.org. Jeff Myers: Christopher High School (Gilroy) is looking for a Hurdles Coach for the 2013 Track & Field Season. Stipend available, please contact Head Coach Jeff Myers if interested. jeff.myers@gusd.k12.ca.us or 408-807-1694. Craig Benson: Mercy High School, San Francisco is looking for assistant track and field coaches for the Spring 2013 season. Stipend available. Please contact head coach Craig Benson at coachbenson@mercytrackandfield.com. Kirk Flatow: Monta Vista High School Track & Field has an opening for the FIRST throwing coach on our new, beautiful track! We have a small throwing team now, but have some real talent to build with--and they are great kids to coach! With the new track, we are hoping to build our throwing group, both girls and boys. We could set at least one new school record this year. Check out mvrunning.com and contact Coach Kirk Flatow at coachflatow@gmail.com. Heart - Stairway To Heaven (YouTube): For you old-time rockers, this is a MUST SEE! From the Kennedy Center - wow. Song Of Joy (YouTube): Now this is what I call a FlashMob for the Christmas Season. YouTube: 40 years ago, 16 year old HS'er Debbie Heald shocks the Russians and the running world. NorCal Jumps Clinic: At Soquel HS on January 5th. All-CCS XC Team: Yohaness Estifanos, Milpitas (Runner & Senior), Terence Rabuzzi, Los Altos (Junior), Steven Sum, Saratoga (Soph), Ben Zaeske, Los Altos (Frosh). Vanessa Fraser, Scotts Valley (Runner & Senior), Claire MacMillan, SLV (Junior), Yulisa Abundis, Aptos (Soph), Lauren Jacob, Los Altos (Frosh). 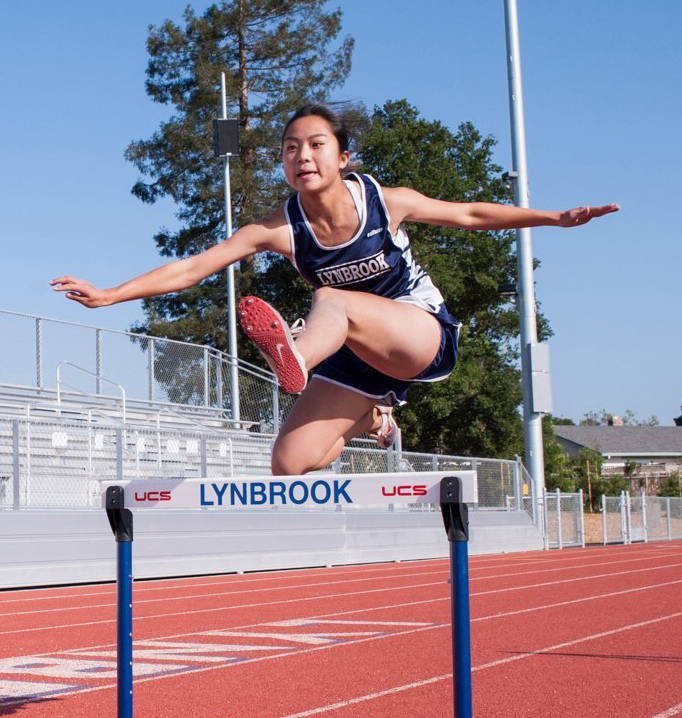 Leland Jumps Clinic: JUMPS CAMP Coach Mr. Bob De La Cruz (408) 221-6247 email: bdlcoach2000@gmail.com Just a Denotation of $50.00 per athletic to: Leland High Track Team NOTE: Coach�s welcome to help 2 weeks and 3 days of practice Starting Thursday, Friday and Saturday. Week one: December 27th, 28th, 29th 2012 Start Time 10:00 AM To 12:00 NOON be on time! Week two: January 3rd, 4th, 5th 2013 Start Time 10:00 AM To 12:00 NOON be on time! 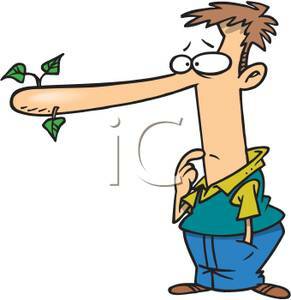 2012 XC: Still looking for 2012 XC results (Footlocker, NXN,...).